A number of countries have expressed surprise that they were included by Saudi Arabia in a new military alliance to fight terrorism. Officials in Pakistan, Malaysia and Indonesia all said they had not formally agreed to join the alliance. 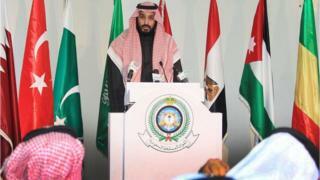 Saudi Arabia on Tuesday said 34 mainly Muslim nations would be part of the counter-terrorism grouping. Prince Mohammed said it would focus on efforts to fight terrorism in Iraq, Syria, Libya, Egypt and Afghanistan. "Currently, every Muslim country is fighting terrorism individually... so co-ordinating efforts is very important," he told a news conference. He indicated there were still "procedures" for these countries to go through before joining, "but out of keenness to achieve this coalition as soon as possible, [the alliance of] 34 countries has been announced". Pakistan's Foreign Secretary Aizaz Chaudhry was quoted in the Dawn newspaper as saying he was surprised by the announcement and had asked the Pakistani ambassador in Riyadh for clarification. The country's foreign office said in a statement later on Wednesday that it was "awaiting further details to decide the extent of its participation in different activities of the alliance" before making a decision on whether to join. In Indonesia, the foreign ministry said it too had not yet decided whether to join. "The government is still observing and waiting to see the modalities of the military coalition formed by Saudi Arabia," foreign ministry spokesman Arrmanatha Nasir told The Jakarta Post. Malaysian Defence Minister Hishammuddin Hussein went further - expressing support for the coalition but ruling out any military involvement from Kuala Lumpur. "The Saudi initiative does not involve any military commitment, but an understanding that we will combat militancy," he said. Announcing the alliance, Saudi Arabia said a joint operations centre would be established in the capital Riyadh and the coalition would focus on terror groups "whatever their doctrine". It comes amid international pressure for Gulf Arab states to do more in the fight against so-called Islamic State. The BBC's Frank Gardner points out that the Shia-majority nations of Iran and Iraq, as well as Syria, are noticeably absent from the alliance. It is far from clear how it could conduct counter-terrorism operations in IS-plagued Iraq and Syria without the agreement of those governments, he adds. Saudi Arabia's list of 34 alliance members: Saudi Arabia, Bahrain, Bangladesh, Benin, Chad, Comoros, Djibouti, Egypt, Gabon, Guinea, Ivory Coast, Jordan, Kuwait, Lebanon, Libya, Malaysia, Maldives, Mali, Morocco, Mauritania, Niger, Nigeria, Pakistan, the Palestinians, Qatar, Senegal, Sierra Leone, Somalia, Sudan, Togo, Tunisia, Turkey, United Arab Emirates and Yemen.